BM: One of the interesting things about eating disorders is that oftentimes individuals with them kind of want their support systems to give up on them, because they’re exhausted and just kind of want to call it quits and be done, especially if they’re struggling with anxiety and/or depression. But there’s research that’s shown that people who have therapists/friends/family who keep on doing the dance with them for 10, 15, 20 years, still have a high rate of recovery. It’s just a question of whether you’re going to stick it out and do the dance with them for that long. RO: By “do the dance” do you mean to stick around even when they’re telling you they don’t want you to? BM: Right, so when they come in for help, we take the approach of “we want to help you get better even though you’ve left five times before [against medical advice],” and even though we know that we’ll probably see you again next year or the year after that. For one of my current clients, this is actually my second time treating her but probably her fifth or sixth time coming to Hopkins. And each time she comes, a little bit more of her is ready and willing to change, so it’s especially crucial for us to say, you know, we don’t care how many times you’ve left and come back, because you’re willing to give it a shot again and we want to be there with you supporting you in trying to get back to those meaningful things in your life, actually find your identity in something else, to be that person you want to be, to have a real quality of life. 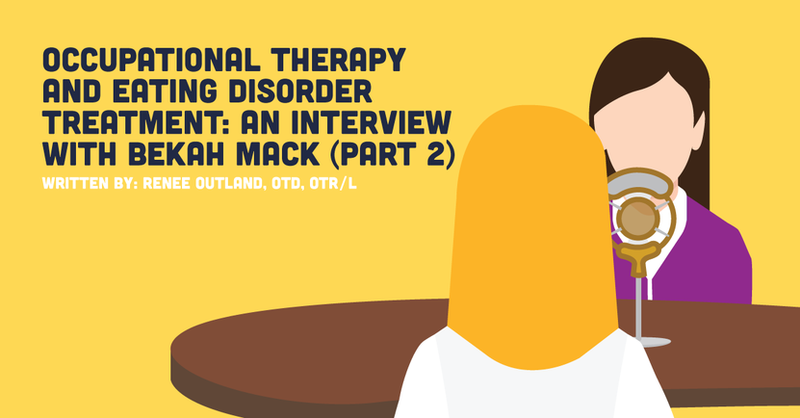 Sticking with it is part of the reason why OT is another important advocate here. What things can we brainstorm through to overcome the barriers that led to relapse last time, or what things do we notice during our motivational interviewing that have improved or changed? I mean, even when someone is readmitted there is always something different from where we ended last time. Yes, it’s quite possible and even likely that within a week or so her eating disorder is going to be really pushing back against that mindset, but the fact that we started off on that note is a hugely significant improvement. RO: Everything you just said is so encouraging to hear because that’s what the whole process is about: finding a little bit more of the self each time. It’s the eating disorder that is the motivation to leave AMA, not their “true” motivation, so sticking with them and saying “this part of the real you, I see that it’s here and I won’t forget, and when you come back that’s where we can start” is absolutely crucial. I’m curious about what your role is specifically in the program at Hopkins; so few eating disorder treatment programs have OTs on staff so there doesn’t seem to be a standard role for us yet. BM: In essence there are opportunities in all aspects of OT to provide interventions for this population, because the eating disorder can affect literally every aspect of their life. So in the inpatient setting I meet with my patients once a week individually to work on the specific goals that we establish when I first evaluate them, and then we have a weekday group. The group includes a variety of things; ultimately I pick the topic based on what I feel the group’s needs are. For example, one of my favorite groups for both of my populations addresses roles. We address the different roles they have, how each role has been impacted by their illness, and what they want that role to look like in the future. Then we brainstorm through the barriers of how do we actually make that happen. Because in treatment there can be an awful lot of talking about what’s wrong, and less frequently there’s problem solving as to how do we actually start tangibly fixing some of those things. And from there we start to address questions like what environmental factors are continuing that disordered habit? What are practical coping strategies and changes that we can do to the environment to modify it in a way that’s going to be more supportive of recovery? What are things that we can start changing in that person’s routine while they’re in inpatient and in a safe but different environment, to carry over for when they go home? How do we start making those practical small changes in order to make it more successful and easier for them to transition into the day hospital, where they’re going to have the opportunity to start getting time off and actually practice the things they’ve been working so hard to learn to implement while in inpatient? RO: Is that focus on roles and transitions seen by the other professions on the team as an OT specialty? BM: It’s hard to say for sure, but I feel like it’s something where they do recognize OT’s unique role. In addition to those groups, something that I’ve begun regularly implementing since I’ve been working there is weekly meal prep groups. They have to plan the meal, and then we work together to prepare it, and so with that it gives them a lot of opportunities to begin figuring out, how do I do this without falling into the rigidity of the eating disorder? We work on helping the clients learn how to estimate portions; the average person without an eating disorder wouldn’t measure out every piece of food – you would just plop what you wanted on your plate, eat what you wanted, and you would get enough nutrients without having to be obsessive about it. So to give patients real life practice of planning and eating meals in a healthy way, we do those OT groups weekly in inpatient and daily in the day hospital. And in day hospital they also go grocery shopping with OT, where they have to meal plan for the entire week. Doing those OT sessions not only gives them the simulation of working through any anxiety and behaviors that may have occurred at the grocery store, but also getting real-life practice so we can address the questions, so how do I make this work, what was hard, what can I do to adapt this situation to make it more recovery based for me in the future, how do I work through this to be supportive? And then we do all the meal prep, so they get practice doing breakfast, lunch, and dinner; we go and do a restaurant outing so they can have the opportunity to figure out how in the world do I utilize this recovery system when I’m not making my own food and I’m going out with people? Nursing will also sometimes do take-out meals with them, but I would say that as far as the full meal-prep process, that is completely left to be done with OT, and our attendings definitely recognize that as a role that we play, along with figuring out meal planning supports for people when they go on days off.